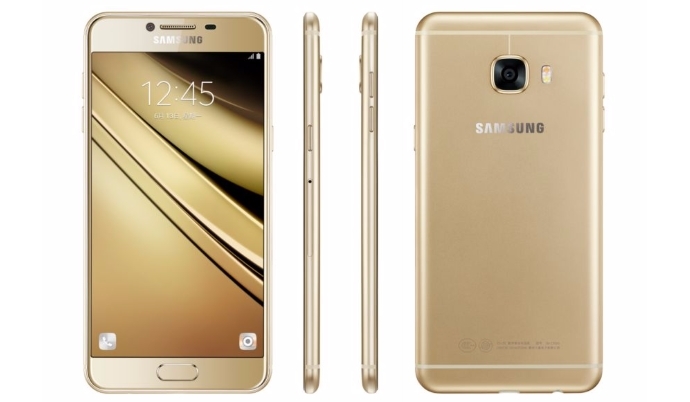 Samsung, the South Korean handset maker, has unveiled a new smartphone under Galaxy C series called as Galaxy C5 in China. Galaxy C5 priced at 2199 Yuan with 32 GB storage and 2399 Yuan for 64 GB variant. The smartphone will be available in Gold, Pink Gold, Silver, and Grey color options. It comes with the rigid metal body, it has only 6.7 mm thickness and a NFC feature which is used only for Samsung Pay. The Galaxy C5 Smartphone sports a 5.2-inch Super AMOLED display with 1920 x 1080 pixel resolution that offers a pixel density of 424ppi and 2.5D curved screen. It comes equipped with Qualcomm Snapdragon 617 octa-core processor clocks at 1.5 GHz accompanied by Adreno 405 Graphics. It is running on latest Android Marshmallow with TouchWiz overlaid. It supports Hybrid SIM slot and offers 4G LTE at one slot. Connectivity options of the device include 3G HSPA+, Micro USB 2.0 port, GPS, Glonass, Beidou, 3.5 mm stereo jack, Wi-Fi and Bluetooth 4.0. The Galaxy C5 houses a 32 GB inbuilt storage (user available space up to 24.8 GB) which can be expandable up to 128 GB via microSD card slot and 4 GB RAM, which is same available on Note 5 smartphone. Talking about the camera of the device, it comes with a 16-megapixel primary camera with an aperture f/1.9 and dual-LED flash that can record videos up to 1080p at 30 frames per second and has an 8-megapixel front snapper with an aperture f/1.9 for selfies and video chats. It has a fingerprint sensor placing on the physical button for unlocking the device. The handset comes powered by 2600 mAh battery which is rating up to 237 hours of standby time and measures 145.9 x 72 x 6.7 mm of dimensions and weight around 143 grams. Yesterday, the company had launched Samsung Galaxy Tab Iris with iris recognition feature that is useful for Aadhar Authentication, which was never heard in the smartphone industry. The biometric features will provide security for a high-speed scan, accuracy, and reliability.